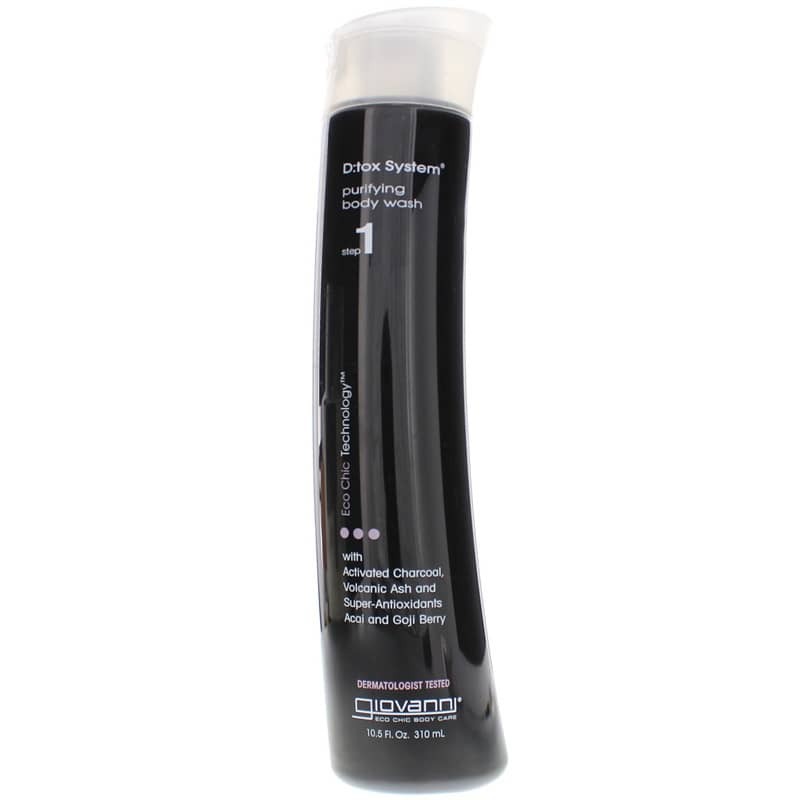 D:tox System Purifying Body Wash Step 1 from Giovanni Organic Body Care features activated charcoal, volcanic ash and super-antioxidants Acai and Goji Berry. Deep within skin, debris and toxins reside, clouding the skins natural radiance. D:tox System Purifying Body Wash uses super-cleansing activated charcoal and volcanic ash to lift pore-clogging toxins, oils and debris- readying them to be rinsed away. Hand-harvested, antioxidant-rich acai and goji berry nourish and rejuvenate, infusing skin with vitamins and minerals so critical to smooth, beautiful, purely touch-worthy skin. The result is skin with noticeable clarity, gently fragranced with essential oils of luscious fig and clean green tea. Aqua (Purified Water), Sodium C14-16 Olefin Sulfonate, Cocomidopropyl Betaine, Sodium Lauroyl Sarcosinate, Glycerin, Activated Carbon (Charcoal), Pumice (Volcanic Ash), *Aloe Barbadensis (Aloe Vera) Leaf Juice, *Euterpe Oleracea (Acai Berry) Fruit Extract, *Lycium Barbarum (Goji Berry) Fruit Extract, *Ficus Carica (Fig) Fruit Extract, *Camellia Sinensis (Green Tea) Leaf Extract, Polysorbate 20, Carbomer, Phenoxyethanol, Iron Oxides (Magnetite), Fragrance (includes essential oils). Step 1: Pour Purifying Body Wash in hands, onto a body sponge or loofah, and apply to skin, creating a rich lather. Rinse. Follow with Step 2 and Step 3 of the D:tox System to complete your skin purification regimen. When I first tried this product, the black color was a surprise. But I love the smell of the product from the essential oils. And I love that the product helps to detox the body, leaving you feeling fresh and invigorated.